Read below for more information on scholarships. We are a school of choice and the State of Ohio has been wonderful in assisting parents to make the best educational choice for their children. Please see the resources below for 2019-2020. Saint Ambrose School is now part of the EdChoice Expansion Scholarship program in Ohio. This is an Ohio income based scholarship program for children in grades K-5 from low and middle income working families. Families can receive a financial scholarship up to the entire tuition cost for Saint Ambrose School. Please contact the school office for more information if this program could benefit your family! For more information on income qualification please click here. Scholarships are awarded and families will be notified directly in summer 2019. The Catholic Education Endowment Trust (CEET) was established in 1976 by the Cleveland Catholic Diocese to promote Catholic education, provide support for religious education programs, and to offer tuition-aid scholarships to families with financial need who desired a Catholic education for their children. As part of this initiative, CEET sponsors a scholarship program to encourage the pursuit of excellence in Catholic education. This program is the Bishops’ Scholarship for Excellence. Now in its 17th year, this scholarship program awards: Eight (8) $3,000 scholarships to current 10th & 11th graders applicable to their 11th & 12th grade years. Sixteen (16) $1,000 scholarship to current 6th & 7th grade students applicable to their 7th & 8th grade years. The Frank & Rita Jane Stec Scholarship Fund was created to help families continue their pursuit of Catholic education for their children. 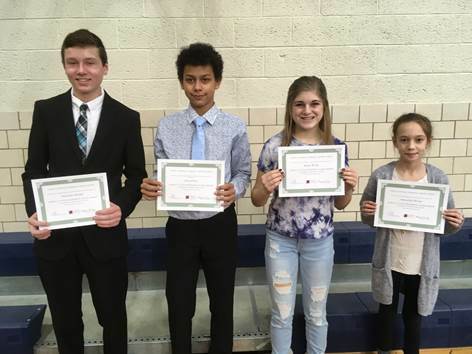 Four (4) non-renewable scholarships will be awarded: Two (2) $1000 to a Saint Ambrose 8th grader entering Padua Franciscan High School and Four (4) $500 Scholarships to a Saint Ambrose 6th grader who will enter into the 7th grade at St. Ambrose. Award recipients will be informed in May, 2019. The Bihari Memorial Scholarship Fund was established in 2018 to help families continue their pursuit of Catholic education for their children in the Saint Ambrose School High School Prep Program. One non-renewable scholarship will be awarded: A $500 Scholarships to a Saint Ambrose student entering grades 6-8. Award recipients will be informed in May, 2019. In 2008, M. Thomas and Beatrice L. Moore established an endowed scholarship fund at the Catholic Community Foundation as a generous act of philanthropy. They wanted to provide four annual $500 scholarships to students in financial need attending Catholic elementary schools in the Diocese of Cleveland. Any Catholic elementary school student who is currently in grades 1 through 7 who will be entering grades 2 through 8 are eligible to receive this one-time award. Unity Catholic Federal Credit Union is pleased to announce the winners of the James E Flynn Memorial Scholarship for the 2018-2019 school year. We held an awards ceremony at our Annual Meeting on February 18, 2018 the students pictured below were able to join us. I hope you will congratulate everyone, Unity Catholic is excited to continue to offer this scholarship to support Catholic Education. The next deadline is 12/31/18 with our drawing in January 2019.